Hurricane Florence is now bearing down on North Carolina, and the media is looking to score political points. 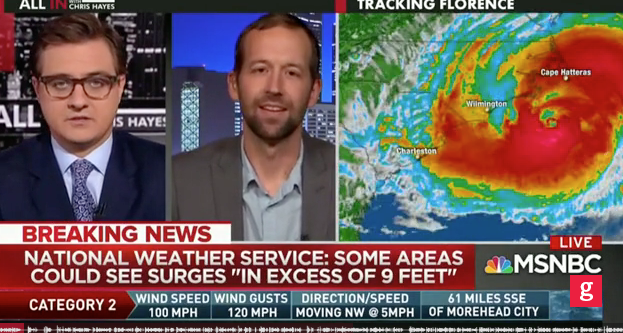 On MSNBC, host Chris Hayes invited meteorologist Eric Holthaus on to argue global warming is making hurricanes worse, and that President Trump is to blame. "We have a president that is denying the impacts of, you know, this hurricane season last year and this year and actively making the problem worse by, you know, not addressing this root cause of worsening storms,” Holthaus told to a nodding Hayes.